Near the end of the shift, we were told that, as a treat, the experienced teachers were going to take the new teachers out to an exclusive bar called “Le Kiosk”. We started to get excited about going out, and were asking lots of questions; how far away was it? what do we need to wear? was it expensive? can we invite other teachers? The answers all came back very vague, making this mysterious bar seem even more interesting. The only thing we were told was that it was usually quite popular and we would likely be standing. The end of the shift finally came and we followed the experienced teachers to Kawasaki station and through the gates. Our AT (like a supervisor) calmly walked up to the Kiosk convenience store that is located in many train stations in Japan and bought a can of beer. 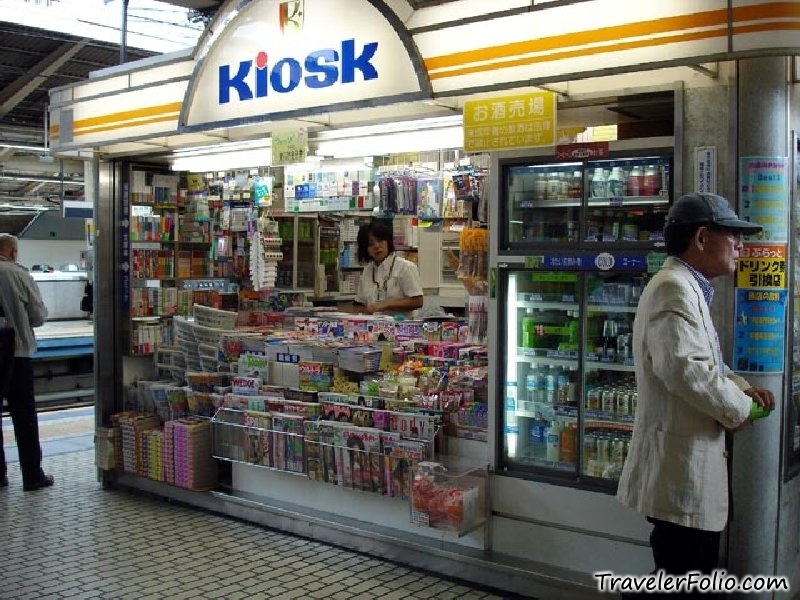 Le Kiosk was in fact just regular kiosk. The experienced teachers had a good laugh at once again getting the newbie teachers to fall for the Le Kiosk ruse, and then we all stood around in the train station drinking beer and chatting. I have to say – drinking beer in public is pretty sweet. After a few beers, I went off with one of the other Canadian teachers to search for a bank machine that would provide money from our Canadian bank cards. I was successful, she was not. We were actually both very lucky that sticking our foreign bank cards into random machines didn’t result in the cards being taken away or security being called. What can I say – the beer was good. In the rest of the time in Kawasaki I ended up making post work beers at Kiosk a fairly regular event. Also, I helped trick several of the new teachers as well. The circle of life continues! This entry was posted on October 8, 2013, 9:00 am and is filed under Drinking, Life in Japan. You can follow any responses to this entry through RSS 2.0. You can leave a response, or trackback from your own site.